Brady Whipple and Taylor Poulsen have been best friends since preschool and playing football together since the second grade. So when Whipple was in desperate need of a helping hand Saturday, it only made sense to turn to his Pahranagat Valley backfield mate. With the Panthers facing a fourth-and-6 from their 45-yard line early in the fourth quarter, coach Ken Higbee called for a fake punt. Whipple ran right with the ball when the play was designed to go left, and it looked as if a swarm of Tonopah defenders would take down the senior running back. Instead, Poulsen took an impromptu lateral from Whipple and raced 25 yards down the left sideline. Five plays later, Poulsen hit Whipple with a 9-yard fade pattern for a touchdown that helped the Panthers clinch their third Class 1A state championship in four years. Pahranagat Valley withstood a furious second-half Tonopah rally to win 22-18 at Arbor View High School. “We looked at each other, he tossed me the ball, and I took off running,” Poulsen said of the fake punt. One week after setting a national eight-man scoring record in a 128-74 semifinal win over Coleville (Calif.), Pahranagat Valley was forced to play a much different game. The Panthers (12-0) ran the ball 45 times for 155 yards, led by senior quarterback Poulsen (96 yards, two touchdowns) and Whipple (53 yards). Tonopah (8-4) rallied from a 14-0 halftime hole with 7- and 63-yard TD runs by Scott Thibodeaux and Denver Otteson in the third quarter. 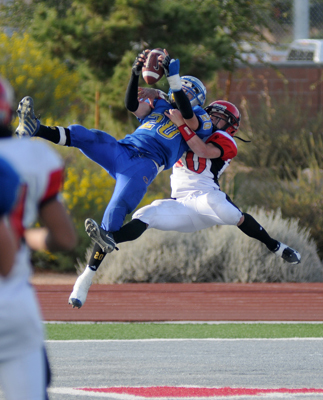 But the fake punt dramatically swung momentum back to Pahranagat Valley. Poulsen completed 9 of 20 passes for 131 yards and one touchdown with two interceptions. Kale Leavitt caught five balls for 88 yards, and Whipple had three receptions for 38. Thibodeaux, Tonopah’s QB, carried 17 times for 134 yards and one score. The senior also threw for 91 yards and one TD and intercepted his seventh pass of the season on defense. Thibodeaux scored 35 touchdowns this season. With its 12th title regardless of class, Pahranagat Valley moved into fifth all-time in state history.